Papua New Guinea is contributing to the development of sustainable tourism opportunities through APEC and is taking a community-level approach to develop tourism solutions. 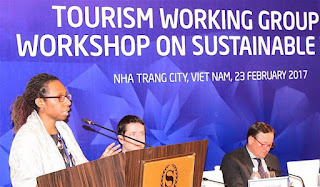 Speaking at the Tourism Working Group workshop on sustainable tourism in Nha Trang, Vietnam, Ms. Alcinda Trawen, from the Tourism Promotion Authority (TPA) provided two successful Papua New Guinea case studies to tourism officials from APEC’s 20 other Members. The two community level case studies covered a sustainable tourism project in Kimbe in West New Britain province, and the other was the development of the Tupira Surf Club, on the North Coast of Madang province. She said both projects have been developed under TPA’s authentic model called Community Based Locally Managed Area (CBLA), in that it promotes the protection of the environment and culture, and enhances tourism sustainability. “We don’t proclaim to have the best community based case studies in the region, but our examples and case studies that are based on real-world experience and organic to our own environment,” Ms Trawen to the APEC meeting in Vietnam. “In Papua New Guinea, our departments that are responsible for Climate Change and Tourism are working in parallel and are enhancing common strength between the two sectors. “One of Papua New Guinea’s overarching characteristics is our culture, which includes a system of landownership, cultural obligations, decision-making. “The Papua New Guinea sustainable development approach takes into consideration things such as community values as well as the broader distribution of benefits. “For example, the Kimbe community-based tourism project has four key areas in which they promote environmental sustainability. “Another community level tourism project being advanced in Papua New Guinea involves the sustainable use of resources. Tupiri Surf Club ill now host the Kumul PNG World Longboard Championships at Tupira on 18 to 25 March this year. She said in the cases presented by Papua New Guinea, each of these are led by community, they maintain significant tourism interest and adhere to important environmental protection criteria.